This is one of those junk shops that has grandiose self-image and calls itself an “Antiques Centre” but we’ll let it off. 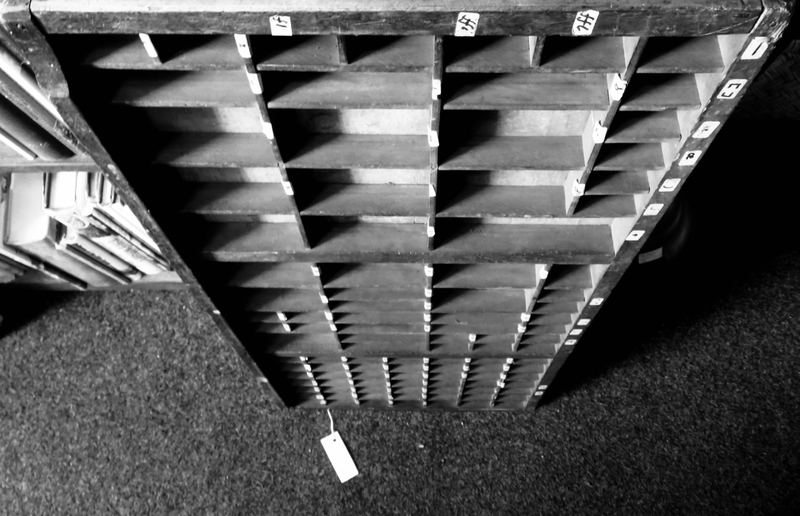 I believe this object is an old typesetting tray, the kind of thing useful when typefaces came as hundreds of small carved pieces of metal. What practical use to anyone it is nowadays, I cannot imagine, but on the other hand it is a pretty cool lump of wood if you ask me. Not that I decided to lug it home or anything. Second Monday morning in a row where I have to haul myself up before dawn and onto the 06:59 train. Not my favoured way to start the week. 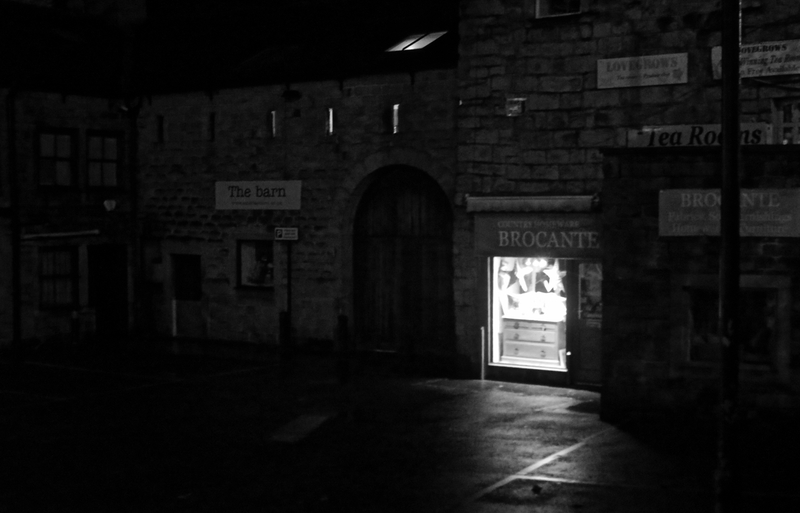 I certainly felt like the first person up in town this morning; though I guess this suggests that either the proprietor of ‘Brocante’ beat me to it, or they just left the lights on all night. 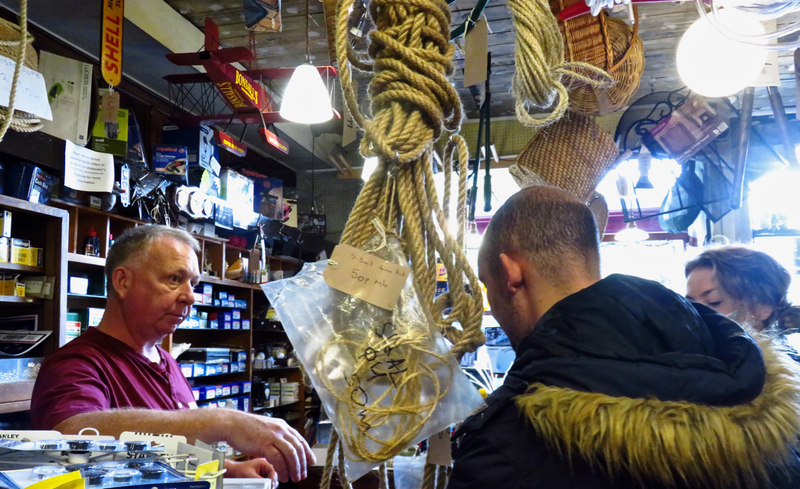 Bonsalls is a Hebden Bridge institution, the sort of hardware store that you thought you only now saw in movies. If it helps prop up the house or garden, you can get it in here. Probably it has been here since Victorian times. But it does take credit cards. This is also a photowhack — that is, the one and only photo taken on a given day. It was far too wet and rainy to take many other worthwhile pictures. ‘Storm Brian’ they are calling it, like they decided to give it the most prosaic name beginning with B that they could think of. Storm Barabbas? Storm Balthazar? Storm Boogie Nights Woah-Woah-Woah….? There must have been hundreds of more interesting names. It certainly does. This shop has been empty for some time, doubtless at some point it will turn into a) a boutique cafe and/or micropub b) an art/jewellry/trinket emporium. 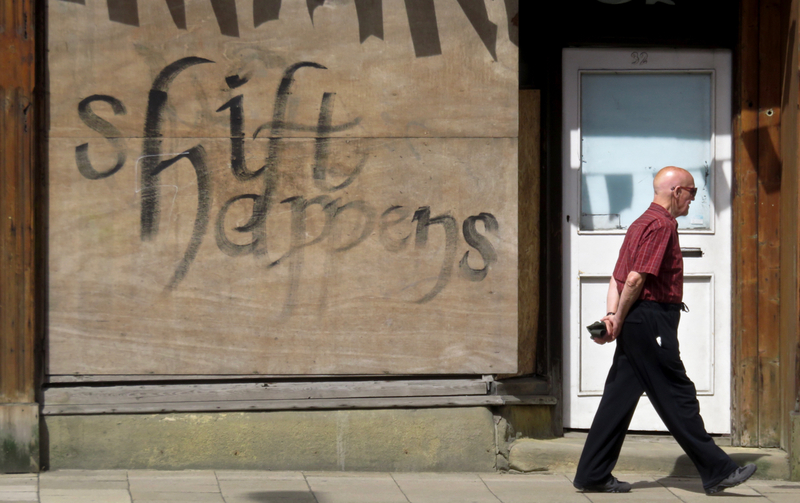 These are, by law, now the only kinds of premises permitted to open in Hebden Bridge. Four weeks after the flood, a positive message. The ‘bobby dazzlers’ in question will not include our parliamentary representative or any of his colleagues elected by constituencies flooded in December 2015, despite the financial resources we expend on furthering their lifestyle, and the moral authority they claim, on the basis that they are “representing the interests of the people”. As pictured at the Manchester Christmas market, which opened this week. He can consider it free advertising. This makes it 28 days in a row, or a full four weeks, with only pictures of Hebden Bridge and Manchester. Look at someone’s home space as opposed to a designed environment like a chain store, and everything will just feel a lot more natural in the former, because the space has grown naturally. 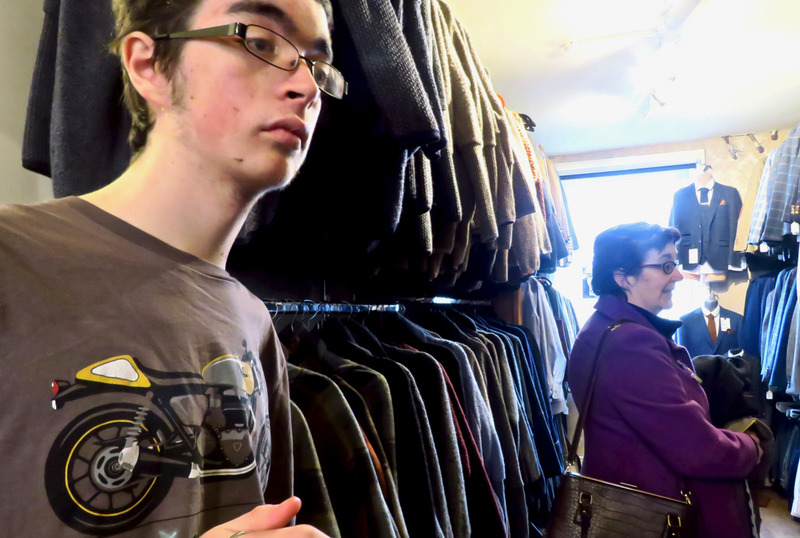 Sometimes I feel this is also true of charity shops like this one, which is why they make more interesting subjects. The dog is just a temporary visitor, but does his/her bit too. Looks like the sale’s been working, but they’re sure dragging it out. Going purely on this blog, there’s no proof this jeweller ever doesn’t have a sale, in fact. Rather dull and corporate I know, but it epitomised my day. Still, the Mac is fixed again after only a short time out, and for free, so thank you Apple.